““After a good dinner one can forgive anybody, even one's own relations.” ― Oscar Wilde, (A Woman of No Importance) Relationships, family, concerns, ideals--all of these and more will be found in this month's issue. 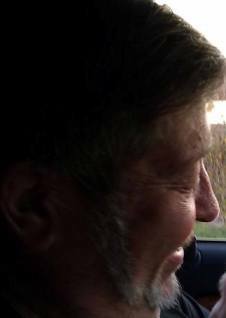 From the columns and articles and poems arise a source of inspiration, perhaps a few laughs, more than a few tears if you are feeling sentimental. Sometimes one must just bury their worries and simply read for the pleasure of it. So here is where you can start. 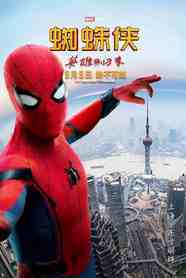 Thomas F. O'Neill's column "Introspective" tells of the excitement abounding in China as they anticipate the new Spiderman: Homecoming film. Their own posters heighten these expectations though the scenes depicted will not, says O'Neill, actually appear in the movie. 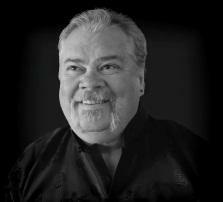 Dayvid Clarkson ("Reflections of the Day") has three reflections included that speak of dreams, aspirations, bedtime stories and practicing kindness and being compassionate. His prose reads like poetry. Judith Kroll's column "On Trek" adjures readers to have a care concerning the bee's so threatened by the use of pesticides. She also closes her column with a dreamy visit. 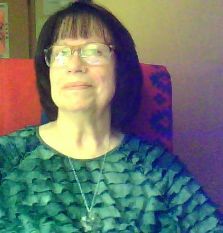 "Armchair Genealogy" by Melinda Cohenour is shown with links to previous columns as a major household move has occupied both mind and body to accomplish. The same move of course has affected husband Rod Cohenour ("Cooking With Rod") so the same convenient links are shown in lieu of his recipe. Looking forward to both of them having spiffy columns for October. "Theatre, Taphophbia and Green Coffins" adds up to some interesting info and a few laughs in Mattie Lennon's column "Irish Eyes." 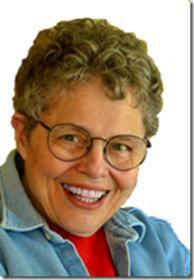 LC Van Savage ("Consider This") discusses "Fabrics and Cliches" for September. She has seen the poem "Cliche Detective" by your editor. She also has an article "A Girl Named Queenie" this month. The other article is "The Work That Keeps Me Going" by Barbara Irvin. 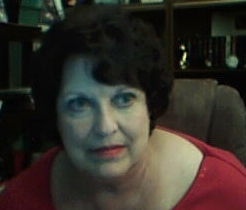 Two more poems written by Linnie Jane Burks--"Visitors to Louisville" and "To Mother at Stella Bullard's Death," carry the themes of friendships and family prevalent this month. Her mother, your editor's maternal grandmother, Carrie E. Joslin's poem "Our Herbert Boy" also has the response written by that Herbert. Another sweet family poem by Lena May Joslin Carroll is titled "Just A'Bragging!" She authored many articles, mostly Bible studies -- she admired the apostle Paul -- and composed many poems, but this is understandably a favorite by your editor's mother. Bud Lemire's three poems are "A World of Fantasy," "Captured Moments," and "I Love Asparagus." Bruce Clifford's poem "Bold" expresses the varied emotions many people feel occasionally but can't say it as well as he does. Phillip Hennessy submitted the just penned verse "It Ain't" via image of the page with it. Thanks, Phillipo. John I. Blair sent these two: "Sunny Mornings" and "New Year." The latter made your editor think of the recent lunar eclipse which once over seemed to suddenly have renewed the world. I was reflecting on dreams, hopes, and aspirations. Most youngsters are taught they can be anything they want to be. Lawyer, Doctor, Actor, Scientist, Athlete, etc. would be on the list. We then inundate them with the best of the best. The richest, the biggest, the brightest, the beautiful are paraded before them in endless media streams as examples of what awaits them. These are, in most cases, unrealistic goals they will never attain. And as they grow we watch them die a slow death realizing they will never achieve these so called dreams. I pray to the four directions that we stop teaching our children these misconceptions, as these are but vain attempts to control the outcomes of our journey. We must unlearn everything we have been taught. We need to come to the understanding that an authentic life lived with mindful intent is all that is worthy of our path. I ask our Elders to ensure that all sentient beings have just enough. For I am satisfied with just enough, no more, no less. And if you have more build a larger table. Sitting on the front steps watching the clouds roll by in the reflections on the lake. The trees stand in the shadows wearing their forest green cloaks and the night is still. I start to laugh and I laugh so hard tears stream down my cheeks. Who am I to figure out this great mystery? It is absurd. We read, we search, we listen, and we seek the answers. We chase dreams and aspirations as we mistakenly think we can control the outcomes. Like a dog chasing its tail. The quiet voice of an Elder comfortably enters my thoughts. “All that is expected and all that is required is to simply live a kind and compassionate life. Do not waste time coveting something that you have been taught to yearn for. Stop trying to be someone the world taught you to be. Manifest plainness, embrace simplicity, and have few desires.” I am grateful for the Elder’s words. This eve I will take the lessons of the day to my resting there to absorb and cherish them. Ever since I was very young I was a huge Spiderman fan. I used to watch Spiderman cartoons on TV after school and like millions of others I too enjoy watching the Spiderman movies online. Superhero movies are immensely popular in America and like many of the superhero franchises - Spiderman has an even bigger draw at the movie theaters in China. I’m not a big movie goer but I do enjoy watching films online via Amazon instant videos and that includes the Spiderman movies. 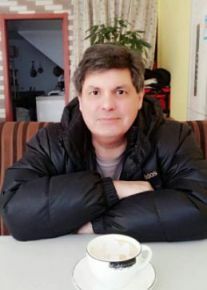 In China, sometimes a scene will be added to an American film such as adding a China location to make the film more appealing for a Chinese audience. The movie studios do this to increase the draw at China’s box-offices. There have been delays in China for the Marvel's blockbuster Spiderman: Homecoming and China’s webslinger fans are waiting with great anticipation for the film’s release. 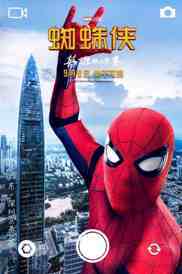 New slated posters have been released in China’s movie theaters featuring the webslinger in familiar Chinese locations as teasers for the ever-growing Spiderman fans. 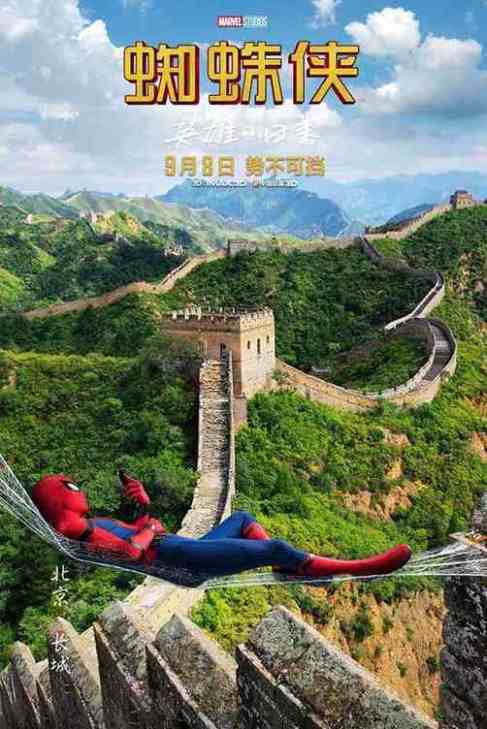 There are various posters in China that show Peter Parker in his Spiderman regalia swinging from a hammock above the Great Wall of China. 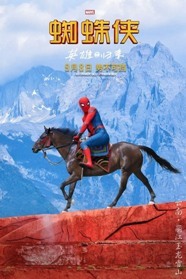 (See Bottom of Column) Another poster shows the webslinger posing for a selfie in front of Shanghai's Oriental Pearl Tower and yet another shows him riding a horse in his spidey-costume across a picturesque mountain-scape. 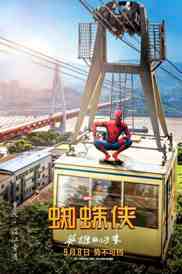 Other posters showcase Spidey posing near various other Chinese landmarks. 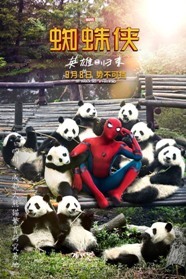 Including, a poster of spidey visiting a group of cute Pandas. None of the poster images will showcase in the actual film but that won’t stop the Spiderman fans from flocking to the theaters on its Chinese release date of September 8th and maybe I will be one of those attending the screening of the film due to being a huge Spiderman fan myself. Hollywood understands the huge profit potential of marketing their films for the Chinese audience due to how popular American films are in Asia. The New Spiderman movie is an example of how Hollywood is using the Chinese culture and their landmarks to enhance an even greater interest in the film. Hollywood’s marketing strategy certainly works and it shows in the movie studios overall profits from Asia. Spiderman: Homecoming is estimated to finish in the $780M range when all is said and done, with China serving as the final market for the film to sizably increase its box office haul. Next Friday, the movie will open in China and attempt to match other recent blockbuster successes in the region. Enjoy the posters I included with this column while I patiently wait for the new Spiderman film’s release date ……. I told you in August about the theatre company, dressing Room 1, bringing the musical, "And all his Songs Were Sad" from page to stage. well the Irish premier was staged, to a capacity audience in saint John's Theatre, Listowel, on August 26th. I had a fairly quiet august myself. Recently I was beside an intellectual at a funeral. You’ll always know an intellectual in a pub, because he won’t have the price of a drink but is not as easy to identify one in a graveyard. (I believe that all funeral undertakers should be obliged to give an undertaking that they would inform mourners of the likelihood of one or more intellectuals being in the cemetery.) As this being of superior intellect gazed into the open grave he asked my opinion on taphophbia. Since I didn’t know the meaning of the word I didn’t have any opinion on it. I wasn’t left in ignorance for long. I soon learned that it is a fear of being placed in a grave while still alive as a result of being incorrectly pronounced dead. I was then promptly informed that the word is from Greek τάφος - taphos, "grave, tomb” and φόβος - phobos, "fear” , which is translated as "fear of graves". He increased my meagre store of knowledge further with the revelation that "Saved by the bell" and "Dead ringer" are both derived from the notion of having a rope attached to a bell outside the coffin that could alert people that the recently buried person is not yet deceased. Of course you, dear reader probably knew that already. 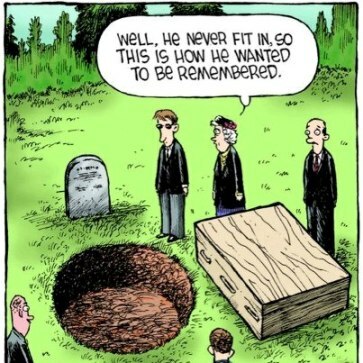 The dear departed was one of my fellow mis-fits who was a bit “different”, a man who marched to a different drummer. And when I described him as a “square peg in a round hole” my new found human enclopedia promised to email me a relevant picture. Which, fair play to him, he did. I already told you about the opening of Clarkes Funeral Home, In Blessington. It was a specular event attended by clergy of many denominations and several dignitaries. There was much to see, riveting speeches and copious refreshments. 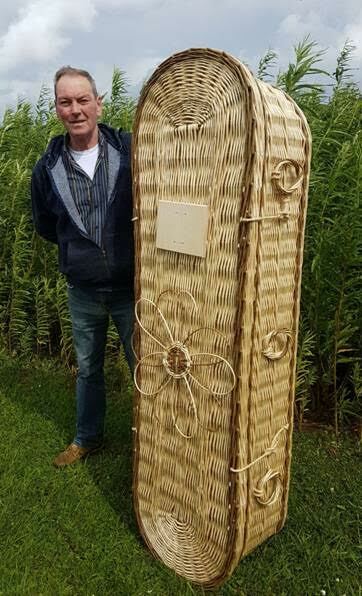 But my eyes were glued to a six foot four Donegal man, Martin, of Green Coffins, Shanagh, Fanad, County Donegal, who was making a willow coffin. In this game of skill the only tools he had were what looked like large secateurs and a piece of flat iron. By evening he had completed the body of the coffin. He answered all questions in lay-man’s language and, unusual on this island, he spoke in glowing terms of his boss, Colin McAteer, who took me through a step-by-step explanation of the process. The dried out willow in their bundles (bolts) are soaked to make them less brittle before use. 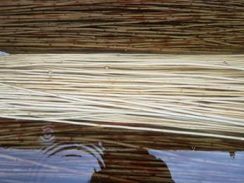 The length of soaking time varies from 1 hour to 8 days depending on variety and thickness of the willow. All their coffins have a timber base – not necessarily for strength but to travel on the rollers of the hearse and crematoriums. The rods are staked and turned up to provide the uprights. Rods are added around the uprights to form the sides using a variety of techniques including randing and plating. 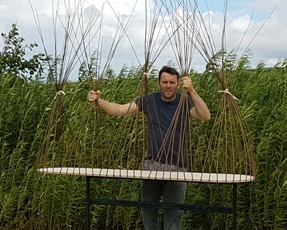 Keeping willow sides this size straight takes experience and patience. When the sides are at the appropriate height you “turn down” the uprights. This must be done before the rods are dried or the rods will be too brittle. An employee of the Jefferson County morgue died this morning, after being accidentally cremated by one of his coworkers. According to the Beaumont Police Department, 48-year old Henri Paul Johnson decided to take a nap one a stretcher after working for sixteen hours straight. 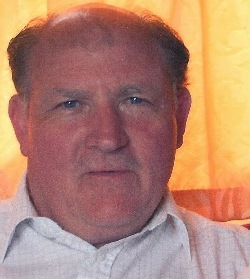 A woman in west Wicklow was on her third husband. One night the latest addition to the marriage bed came in, full of porter, and started laying down the law. For emphasis he was hammering the kitchen table with his fist. Calmly, but sternly, the wife said, "Don't break that table. There was two good men wake'd on that an' it'll be wanted agin." Due to month long preparation and accomplishing a major household move by the Cohenours, the next part of the tale of Sidney Washington Creek will be in the October issue. Do you love clichés as I do? I honestly don’t think I can go for one hour of conversation without using one or more. They were created because they are true; however, in our writing culture we’re not really supposed to use them too much, or to rely on them. I don’t know why. They can be so perfect. Especially when one is glib-challenged as I am. Cliche, also spelled cliché, is a 19th century borrowed word from the French which refers to a saying or expression that has been so overused that it has become boring and unoriginal. The phrase likely comes from the tailor’s trade where an employee came into work and would find a huge pile of tailoring jobs, fabrics already cut out into patterns, waiting for him, leaving everything else for him to do with it all; measuring, fitting, sewing, lining, patching, button-holing, pressing, fitting, shortening, lengthening, etc. It might have started in the middle of the 19th century and the phrase can maybe be found in a Dickens novel. And it may have meant that once all the work was cut out, it was difficult to keep up. It seems that this is how it’s used today---if your work is cut out for you, you’re in for a long day! And yet, one might think that if the work is already cut out for an employee, that would lessen his chores for the day. This is a tough one. Which do you think it is? I am not completely sure. If perchance you’re making a suit for a customer, it’s a pretty good idea that the tailor cuts the jacket, vest and trousers from the same piece of cloth. That is if MiLord wants a perfect match in his ensemble, and most well-dressed men do. I mean who wants to pop into one of the local Armani shoppes for a snazzy ensemble to be worn at THE party of the year and to look down as he makes his entrance and notice to his horror that the jacket is one shade of taupe, the vest burnt umber, the pants dark ochre and the weave in each going from window screen to pot-holder lattice? It simply will not do. Due to month long preparation and accomplishing a major household move by the Cohenours, the next treat for our taste buds will be in the October issue. For the convenience of regular readers of this column, remember you can click the byline above and access a clickable list of prior columns with all those delicious recipes. Bird's didn't sing their songs. From the now bad water and pesticides. At what cost does the garden grow? When living things die, babies deformed..
Who can eat and drink money? the HUMAN band of love. She came to me within the fold of a sunlight beam. as my child of light came to visit. Her warmth of love will always be with me..
And all his nature mild. He worked as boys should. In the evening, when the sun was low. To bring "old Cherry" home. Our little boy would go. And lived by the golden rule. In the church and Sunday School. Of the boy who learned to roam. And to bring him safely home. to make their home out in the west. seems now like a pleasant dream. the shortest years we have seen. As all dreams surely do. and the goodness of those two. Who, I'm sure, deserve the best! It makes no Sense, at all!! There's Mama and Papa and Baby and Lady Bugs numbering three. Papa is known as John Edward, and Mama of course is me. We're a mighty fine little family, as happy as happy can be. And rich--why let me tell you--we've lots can't be bought, you see. There's Baby now, we wouldn't trade her for all the gold in the sea. And Daddy--well, Daddy's just Daddy and none is made better than he. What all this lovely family would do--if there was no me! Here, too, placed their marks. But you'll never see it! It's covered with S M O G! Moments, are to share, so you too can be aware. Of all the wonderful things found, if you could see. rewarded by what I do. She also isn’t always cruel. is truly the greatest. I Love you, Vicki. it, it is good for you. Remember Anna Mary Robertson? She became Anna Mary Robertson Moses, and eventually, Grandma Moses. Everyone knows of her and her style of painting; primitive, naïve, art brut, self-taught and now called “outsider art,” and it has always has been my most favorite genre. But what was especially terrific about that great lady was that after years of hard farm work, raising ten children and painting for fun, she began to paint scenes from memory seriously at age 78. Seventy-eight! Imagine that. And that’s when she was discovered. That’s just one year short of when I finally wrote and got my first really and truly serious book into print, and the whole thing has me slightly spinny. Well folks, hope springs eternal and while I doubt the Pulitzers will be calling, or the New York Times or even Hollywood, I still have a book to hold in my hands, and it has my name in big letters on the front. “Thrilling” just simply doesn’t cut it. I know lots of you out there have written books, successful books, so you know about the thrill thing. It’s amazing. Just flat out astonishing, right? What’s especially meaningful to me, apart from finally completing this novel, is that I did it on the cusp of my 80th birthday. Why did I wait? I have no clue. Laziness? Fear? Probably. But I’m hoping that perhaps there’s some truth to those ancient and boring axioms such as, “all good things come to those who wait” or “some wines turn to vinegar, but the best improve with age.” Maybe my book is vinegar, but I waited so long to do it I’d like to think the words swirling around in my head that I put on paper pages, have improved with age. And I know that even my hero Grandma Moses had to hear and read negative things about her paintings, and I’ll have to do ditto about this book of mine. It is what it is. I get it, and at nearly 80 I’m allegedly a grown-up, and if this happens, I can take it. Not. It’s like a birth, this book launch thing. I’ve given birth to a book baby and I want to hold it out to the world and I want the world to love it and think it is beautiful and important. Will it? I’m so often told by my once-were-flower-child pals that if one just thinks positive thoughts, good things will happen. Seriously? Doesn’t work so well with a kidney stone attack, but whatever. I’m really trying. This book, my book, is called “Queenie” and it’s a story of a young girl in the 1950s who learns in the very hardest way to be accepting of all people, even those for whom she’d had nothing but contempt. Given the name “Queenie” well into the book, she suffers humiliations, learns to step away from learned hatreds and overcomes a shattering family scandal. This book was edited cleanly, kindly and intelligently by none other than one Raye Leonard, who beautifully edits The Coastal Journal out of Bath, Maine. The book will be at all Maine bookstores quite soon, but as of this minute, it is at the Gulf of Maine, on Maine St., in beautiful downtown Brunswick. And of course, it’ll soon be on Amazon. If I am able to gather up whatever shreds of courage I may have within, I will try for a book signing one day. I’d like to ask something of you, on behalf of Grandma Moses and me too ---if you have a book or a painting or an anything brewing inside of you, do it. Bring it to life. Don’t wait the way Grannie Moses and I did. She had about 26 years left and everyone knows how well she did. I am nearly 80 and have no clue how much time I have left to watch this new book baby grow, or even if it will. I wish I’d done it sooner but I also know that spending time wallowing in regrets is stupid and non-productive. So folks, no matter what your age, go for it!! Whatever “it” is. It’s wonderful if these creations of ours make tons of money for us, but honestly, the real high is getting it done and out into the world. Trust me! Do it!! You will never regret it. I don’t. Grandma Moses surely didn’t. Dreams. We all have them. They are a huge part of who we are. What we do in our professional lives has a tremendous effect on our physical and mental wellbeing. During the day, I work in a factory. I would be lying if I said the job wasn’t mundane at times. Actually, it’s more dull than it is exciting. It’s what I do when I’m not at my day job that makes a difference. 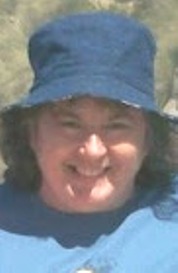 I began a freelance writing career a few years ago. There are so many perks to this type of work. I don’t have to leave home, and I can conduct correspondence by email. Writing is my refuge. It’s a safe haven where I can dump all of my problems and channel my frustrations so that something truly wonderful can evolve. Nothing makes me feel more satisfied than when I reach the completion point of a story, essay, or article. And there is no greater joy than seeing my work in print.